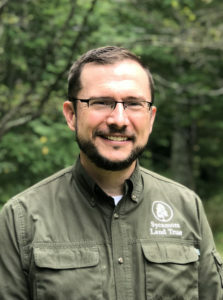 Beginning on September 1, John Lawrence stepped into the role of Interim Executive Director for Sycamore Land Trust. John has been on Sycamore’s staff for 12 years, including the past 10 as Assistant Director. Possessing a deep knowledge of land acquisition and stewardship, and a passion for nature, he is well suited to serve in this position. We’re excited for this transition period, which brings with it new opportunities! John will serve as Interim ED until a permanent ED is named. The deadline for applications is September 30. He is taking over the role after the departure of Christian Freitag, who joined Sycamore’s staff as its first employee in 2000 and is leaving to direct the Conservation Law Center. John can be reached at 812-336-5382 ext 105 or john@sycamorelandtrust.org.